The Nissan Qashqai (shown) is Europe's top-selling compact SUV. European demand for compact SUVs will continue to grow strongly in the midterm as new and updated models are added to the sector, segment-leader Nissan and analysts predict. Sales in the segment are on track to grow by 200,000 this year to 1.9 million and rise to 2.2 million by 2020, analysts at IHS Automotive predict. The segment is benefiting from a lot of fresh models. Nissan’s sector-leading second-generation Qashqai debuted in early 2014. Renault launched the all-new Kadjar in late 2015 and Hyundai replaced the ix35 with the Tucson in the second half of last year. Those two key arrivals helped boost compact SUVs to a 26 percent share of Europe’s overall SUV market in October compared with 24 percent during the same period in 2014, figures from analyst JATO Dynamics show. Sales and market share for compact SUVs are poised to keep rising this year because of the arrival of the new generations of the Volkswagen Tiguan and Kia Sportage and the refreshed Ford Kuga. This means all models in the segment’s top five will have undergone some level of significant upgrade within the last two years, making it one of Europe’s most competitive vehicle classes. What’s unique about the compact SUV segment is that, unlike in other sectors in Europe, premium models are not at an advantage over their mass-market competitors. “Compact SUV sales are less affected by the premium brands because it is a massive growth segment and, put simply, there is room for everyone to claim a piece of the action at the moment,” IHS analyst Tim Urquhart told Automotive News Europe. If premium compact SUVs were folded into the volume segment the Q3 would have ranked sixth with the Mercedes-Benz GLA at No. 7 and the Range Rover Evoque rounding out the top 10, based on JATO’s figures. Customers in this segment typically place a higher value on design than they do on the badge. “Styling is the No. 1 reason for buying it,” Hyundai UK boss Tony Whitehorn said of the Tucson. He told Automotive News Europe that the UK is currently the biggest European market for the Tucson, but it also is doing well across Europe, finishing sixth in JATO’s October sales numbers. If Tucson and ix35 sales were combined Hyundai would have ranked third based on 10-month sales in the segment. Car buyers in the UK were on pace late last year to purchase 330,000 volume and premium compact SUVs in 2015 to narrowly beat customers in Germany. The UK also is expected to be Europe’s largest market for the vehicles in 2016 and 2017, based on IHS Automotive forecasts. One of the key drivers behind this is the strong demand for the UK-built Qashqai, which is produced in Sunderland, England. 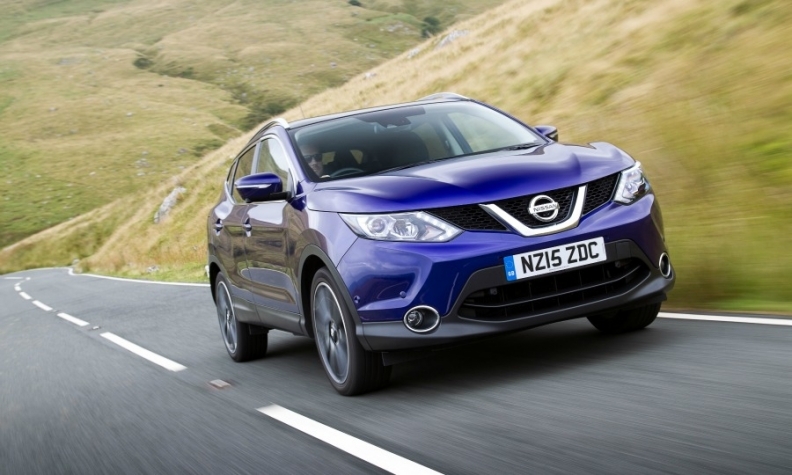 The Qashqai accounted for nearly a quarter of all compact SUV sales in the UK, JATO’s 10-month figures showed. The Qashqai is also the top-selling compact SUV in France, Spain and Italy. One exception is Germany, where the Tiguan is tops. Nissan executives believe the Qashqai would be even more successful in Europe if it could have produced more. “We’ve been up against the limits of manufacturing capacity in Sunderland. We could have sold more,” Willcox said. Last month Nissan started building Qashqais in Russia to meet local demand, a move that will help reduce pressure on its plant in northeast England. The Renault Kadjar, which shares its underpinnings with the Qashqai, is also poised to have a strong 2016 after its hot sales start last year. By October the Kadjar ranked at France’s No. 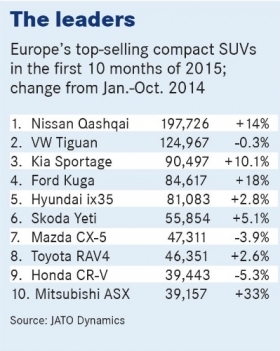 2 compact SUV just five months after its sales started. Renault is expected to sell 134,000 Kadjars in Europe this year, according to an IHS forecast. VW’s Tiguan was expected to finish 2015 with 160,000 sales and increase its European volume to nearly 180,000 in 2016 with the arrival of the new-generation model, IHS predicts. The new Tiguan was revealed at the Frankfurt auto show along with news that it will be available in three different versions: sports, off-road and a classic on-road model. That Tiguan will share its MQB platform with a pair of models from sister brands Skoda and Seat. Those models also will debut this year. A report from German car magazine Autobild in early December predicted that Skoda’s model, dubbed the Snowman in media reports, would be revealed at the Paris auto show in the autumn and sit above the Yeti, which ranked sixth in Europe’s 10-month sales chart. Meanwhile Seat’s unnamed compact SUV will feature a styling that is “less off-roadish” and “more emotional,” Juergen Stackmann told journalists last year before moving from Seat CEO to VW brand’s global sales chief in October. Seat’s first SUV could be followed by a larger model, which was previewed by the 20v20 concept at the 2015 Geneva auto show, Stackmann said. Opel/Vauxhall, which flopped with the Korea-built Antara, is the biggest European automaker without a competitive compact SUV. The General Motors unit plans to re-enter the segment in 2017 with a crossover that also will replace the Zafira compact minivan. “It will be a nice combination of minivan with SUV looks. It means we are playing into the family car market,” former Vauxhall head Tim Tozer said prior to resigning from the company in October.